You're one call away from savings. Call today! It's no secret that financial stress can be severely taxing (no pun intended). Despite our best efforts to be fiscally responsible and careful with our cash, the fact of the matter is that life can be expensive. Not only do costs for necessities keep rising, but we live in a relatively tough economy. Many hard working American families today face circumstances in which their average income doesn't cover all essential expenses. 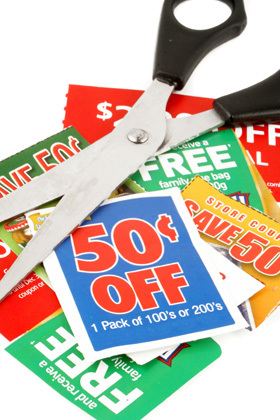 Coupons can be a real stress saver and, obviously, a money saver as well. These days manufacturers offer coupons for all your must-have products (groceries, apparel, sundry items, footwear and just about any material thing you can think of). You can also easily get coupons for services, such as automobile oil changes, tire rotation, dry cleaning, yard work or plumbing. In today's tough economy, anything that saves us money and makes our financial planning a little simpler is much appreciated! Keep a special envelope in your backpack or purse just for coupons, or make a point of keeping a few that you're sure to use in your wallet. If you carry a reusable grocery bag for food shopping trips, that's a great place to keep your food coupons, too. Making use of coupons can really help out the family budget (and maybe free up a few dollars along the way). Start Saving Today! Call Us Now.